nah the resulting integral should be root 3 tan inverse root 3???? not one on root 3 tan inverse root 3? what would be the e4 cutoff ???? carrotsticks? anyone? stesoo and JaxsenW like this. I've updated the solutions. Thanks everybody for your input. Also please like this meme so I can feel validated as an oldie who can still connect with students. Smash that like button, remember to subscribe, and click on the bell notification so you don't miss out. Squar3root, BLIT2014, iStudent and 9 others like this. jathu123, pikachu975, boredofstudiesuser1 and 1 others like this. Surely they wouldn't penalise this?! The co-ordinate axes could quite easily be generalised via a linear transformation. This is actually the best way of doing these. Regarding penalty, I actually cannot say for sure, but I am reasonably confident it will be okay. Amongst endless non-attempts, they see someone have a different solution. It will get given a lot of attention for sure, and hopefully those people know the maths behind it. I think it'll be accepted. @other people reading this, in general any system that's been tilted you can 'untilt' and work the ratio from here. For more reading look up "Affine Transformation". Heaps of past HSC questions on things like this. Looking for a copy of the paper, is there anything anywhere? With the rotation of the conic point thingo, i made it into a complex number and multiplied by i then converted it back. It got me the answer so I hope I'm not wrong. tbh I used to do stuff like this all the time in my HSC before I knew what affine transformations were. At SB the teachers were pretty chill about hack solutions, but I was often quite suspect if they were like that as markers. It was mostly out of sheer laziness, I'd just look at a length and be like 'Nah fk you imma let you be one unit' (3d trig <3). Or look at a point and go 'nah I don't like where you are, gtfover here'. I was super psyched when I saw you put this idea to use in your 4U 2013 BOSTES transformation in Q16b)-d), but ofc you made em prove it lmao. BLIT2014, jathu123, pikachu975 and 3 others like this. This is coming from someone who skipped anything that looked like mechanics, conics or any other question that required heaps of thought. When I did the 2013 paper I thought it had the easiest last question I've ever done in a 4 unit exam. Honestly I had a lot more problems with Q15 than Q16. Was 2013 really that hard? Fingers crossed it was, because I felt that ours was honestly harder than 2013.
same... I was hoping for 97 too but I'm gonna need a small miracle to get it. 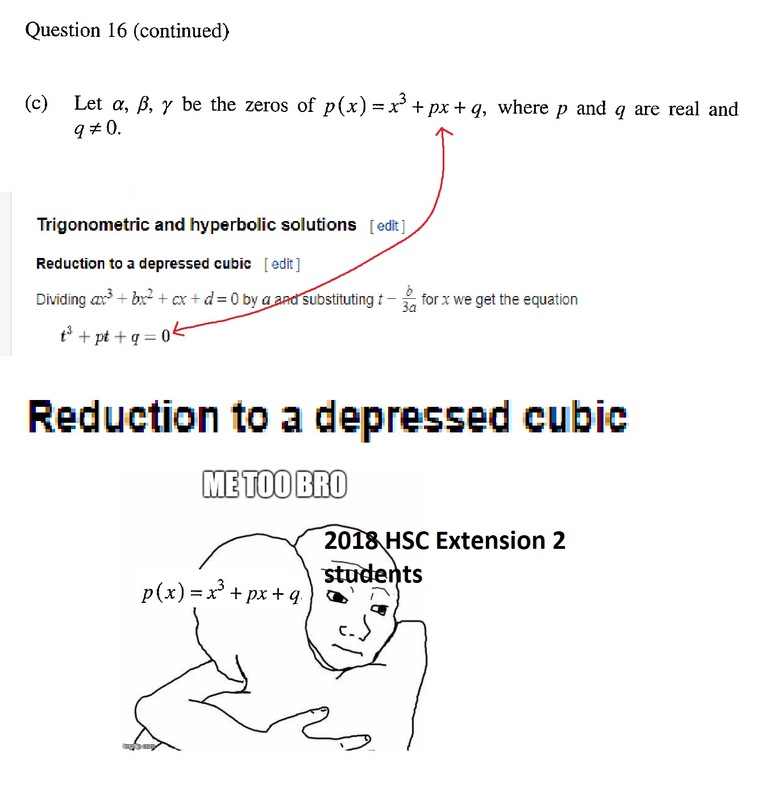 2013 graduate, can confirm I lost way more marks in Q15 than 16. 1729, JaxsenW, fan96 and 1 others like this. 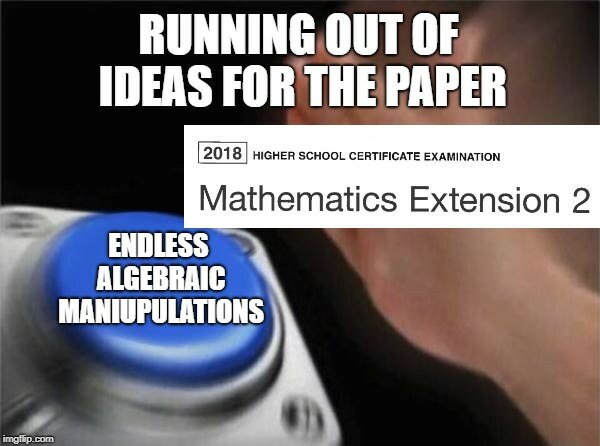 How would you compare the difficulty to this years paper?